The Great Rift Valley is a geographical and geological feature running north to south for around 4,000 miles (6,400 kilometers), from northern Syria to central Mozambique in East Africa. Astronauts say it is the most significant physical detail on the planet that is visible from space. In Africa, the terrain ranges from salt flats more than 500 feet (152 meters) below sea level to towering, snow-capped mountains. The Rift is known for its spectacular scenery and abundant, sometimes unique, wildlife. A series of some thirty lakes lies along its length; the three largest in Africa are known as the Great Lakes and include Lake Tanganyika, the second deepest lake in the world, and Lake Victoria, the second-largest freshwater lake by surface area in the world. Some of the oldest remains of ancestral humans have been found in in the African segment of the valley. The Great Rift Valley varies in width from twenty to sixty miles (thirty to one hundred kilometers), and in depth from a few hundred to several thousand meters. 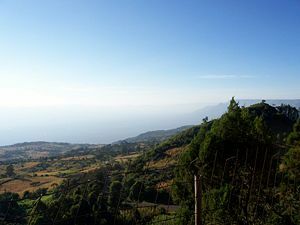 The northernmost part of the Rift forms the Beqaa Valley in Lebanon. To the south, in Israel, it is known as the Hula Valley separating the Galilee mountains and the Golan Heights. Farther south, the valley is the home of the Jordan River, which flows southward through Lake Hula into the Sea of Galilee in Israel and then continues south through the Jordan Valley into the Dead Sea on the Israeli-Jordanian border. 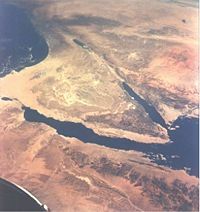 From the Dead Sea southward, the Rift is occupied by the Wadi Arabah and then the Gulf of Aqaba and the Red Sea. The southern end of the Red Sea marks a fork in the rift. The Afar Triangle or Danakil Depression of Ethiopia and Eritrea is the probable location of a triple junction, which is possibly underlain by a mantle plume (an upwelling of abnormally hot rock within the earth's mantle that helps the earth to lose heat). The Gulf of Aden is an eastward continuation of the rift—before the rift opened, the Arabian Peninsula was attached to the Horn of Africa—and from this point the rift extends southeastward as part of the mid-oceanic ridge of the Indian Ocean. In a southwest direction the fault continues as the Great Rift Valley, which split the older Ethiopian highlands into two halves. In eastern Africa the valley divides into the Eastern Rift and the Western Rift. The Western Rift, also called the Albertine Rift, is edged by some of the highest mountains in Africa, including the Virunga Mountains, Mitumba Mountains, and Ruwenzori Range, and contains the Rift Valley lakes, which include some of the deepest lakes in the world (up to 1,470 meters deep at Lake Tanganyika). Many sites in the Albertine Rift are protected as national parks, wildlife reserves, or forest reserves. But there are several other sites important for conservation that require legal protection in the future, mainly in the Democratic Republic of Congo. In Kenya, the valley is deepest to the north of Nairobi. As the lakes in the Eastern Rift have no outlet to the sea, these lakes tend to be shallow and have a high mineral content as the evaporation of water leaves the salts behind. For example, Lake Magadi is almost solid sodium carbonate, and Lakes Elmenteita, Baringo, Bogoria, and Nakuru are all strongly alkaline, while Lake Naivasha needs to be supplied by freshwater springs to support its biological variety. Sodium carbonate, however, creates an ideal breeding ground for algae. Several species of fish, tilapia in particular, thrive in this environment. As a result, millions of birds flock to these soda lakes to feast on the abundant food supply of algae and fish. Each of the lakes in the Rift Valley string has a slightly different water composition ranging from freshwater to extremely alkaline, highly saline to brackish. Subterranean movement is common today as the Rift Valley is home to thirty active and semi-active volcanoes and countless hot springs along its length. The formation of the Rift Valley continues, probably driven by mantle plumes. The associated geothermal activity and spreading at the rift has caused the lithosphere to thin from the typical sixty-mile (100-kilometer) thickness for continents to a mere 20 kilometers. If spreading continues, the lithosphere may rupture several million years from now, splitting eastern Africa off to form a new landmass. This would lead to the formation of a new mid-ocean ridge. The volcanic activity at this site and unusual concentration of hotspots has produced the volcanic mountains Mount Kilimanjaro, Mount Kenya, Mount Karisimbi, Mount Nyiragongo, Mount Meru, and Mount Elgon, as well as the Crater Highlands in Tanzania. The Ol Doinyo Lengai volcano remains active and is currently the only natrocarbonatite volcano in the world. When the Bantu peoples left West Africa about five thousand years ago, one branch moved east and reached the Great Lakes region two thousand years later. The descendants of the groups that remained established the Buganda, Bunyoro, and Karagwe Kingdoms, while others continued on to the Indian Ocean coast or moved south to Lake Malawi. The first Europeans to penetrate Central and East Africa reported snow at the equator but were not initially believed. The Royal Geographical Society sent an expedition to the region in search of the Nile's source. The detailed reports of that trip helped Austrian geologist Eduard Suess formulate his theory that the system of valleys and lakes that crossed Arabia and Africa was part of a continuous trough. 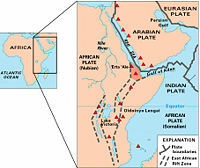 In 1891 he published a paper attributing the geology and structural geography between Syria and Malawi to interconnected movements within the Earth. The following year, British explorer John Walter Gregory began his explorations of East Africa. His comparisons of geological strata led him to conclude that faulting, not erosion, had formed the valley to which he gave the name "Great Rift Valley," the name still used for the entire African Rift. The Rift Valley has been a rich source of fossils that allow study of human evolution. Richard Leakey has speculated that the diversity of environments resulting from the creation of the Rift Valley provided "an ideal setting for evolutionary change." The presence of multiple lakes in the region would have drawn animals, including hominids. Furthermore, the rise and fall of lake levels and seasonal flooding of rivers aided in burying and preserving bones. The numerous active volcanoes in the region provided volcanic ash that would later allow dating of the fossils that were found. There is no reason to conclude that early hominids were confined to East Africa, but because the rapidly eroding highlands filled the valley with sediments, a favorable environment for the preservation of remains was created. The bones of several hominid ancestors of modern humans have been found there, including those of "Lucy," a nearly complete Australopithecus skeleton that was discovered by anthropologist Donald Johanson. The husband and wife team of Richard and Mary Leakey has also done significant work in this region. It has been suggested by scientists that the Rift's trough may have been an important route for human dispersal. The African Rift Valley lakes include some of the oldest, largest, and deepest lakes in the world, and many are freshwater ecoregions of great biodiversity, while others are alkaline or soda lakes supporting highly specialized organisms. 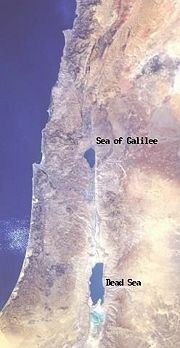 Two major lakes are located in Asia: The Dead Sea and the Sea of Galilee (Lake Tiberias). Lake Tana (3,600 square kilometers; elevation 1,788 meters) (1390 square miles; elevation 5,865 feet)—the source of the Blue Nile—is not a Rift Valley lake, but lies in the Ethiopian highlands north of the Rift Valley. South of the Ethiopian highlands, where the Rift Valley splits in two, the Eastern Rift is home to the Kenyan lakes, while most of the Central African Rift Valley lakes lie in the Western Rift. The Kenyan section is home to eight lakes, of which two are freshwater and the rest alkaline. Of the latter, the shallow soda lakes of the Eastern Rift Valley have crystallized salt turning the shores white, and are famous for the large flocks of flamingo that feed on crustaceans. Lake Turkana (6,405 square kilometers; elevation 360 meters) (2,473 square miles; elevation 1,180 feet)—alkaline, is the largest of the Kenyan lakes, on the border of Kenya and Ethiopia. The lakes of the Western or Albertine Rift, together with Lake Victoria, include the largest, deepest, and oldest of the Rift Valley lakes. They are also referred to as the Central African lakes. Lakes Albert, Victoria, and Edward are part of the Nile River basin. Lake Victoria (elevation 1,134 meters (3,719 feet)), with an area of 68,800 square kilometers (26,563 square miles), is the largest lake in Africa, but is not actually within the Rift Valley; it occupies a depression between the Eastern and Western Rifts, formed by the uplift of the rifts to either side. Lakes Victoria, Tanganyika, and Malawi are sometimes collectively known as the African Great Lakes. The Western Rift Valley Lakes are freshwater and home to an extraordinary number of endemic species. Approximately 1,500 cichlid fish species live in the lakes, as well as other fish families. The lakes are also important habitats for a number of amphibian species. A wide variety of fauna inhabit the Rift Valley. Those parts that are grasslands contain a greater concentration of wild animals than any other area of comparable size. Species unique to the Rift Valley include the mountain gorilla that is found on the forested slopes of the Virunga volcanoes and fish that dwell in the alkaline springs. The wide variety of terrains—from desert to mountain—results in adaptation of flora to altitude, temperature, and rainfall totals. History of "Great Rift Valley"
This page was last modified on 13 July 2017, at 16:42.